Do you tend to sleep in your recliner? Many people do sleep in their recliner and you should also consider if you have been advised to keep your feet above your heart to improve circulation. Having a pad that serves as a mattress can be helpful when choosing a recliner. Also, for those who might have control issues, incontinence pads are available. Waterproof coverings are another option. 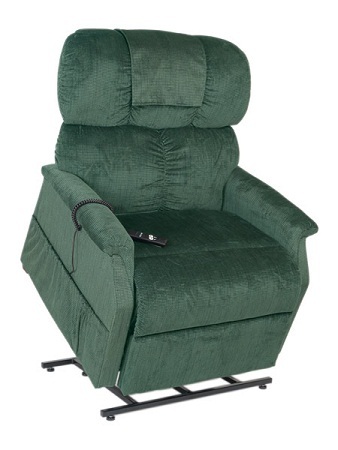 Do you spend a considerable amount of time in your recliner? If this is your primary chair, then the answer is most likely yes. You’ll want to look at chairs of three or more positions so that they will be more comfortable for long periods of time. If you’re looking for a lift chair that is primarily for sitting, a two position chair should be sufficient and considerably less expensive. Do you usually eat or drink while in your recliner? If so, considering the fabric for your chair should be easy to clean, in case of spills. Custom-made tables for your chair are also an option. Do you have a pet that usually sits with you in your recliner? Consider this when looking at sizes for your lift chair. Check the weight capacity for the chair. If you purchase a chair that’s designed for a smaller weight, then the chair lifting mechanism may not work properly and the chair cushion may also break down becoming uncomfortable. Do you have any physical conditions or injuries? There are a wide variety of options available for almost any sort of condition you may have. We can help find chairs that will enhance circulation and swelling issues, adjust firmness levels, and even have removable arms so that sliding in and out of the chair is easy. Where do you plan on putting your lift chair? Some lift chairs need up to 22” of space between the wall and the chair, so be sure to measure the area you plan on putting your lift chair. If space is limited, some wall hugger models are also available.